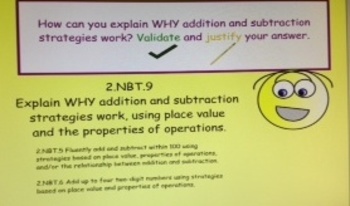 Common Core standards require students to be able to explain why addition and subtraction strategies work, using place value and the properties of operations of 2.NBT.9. 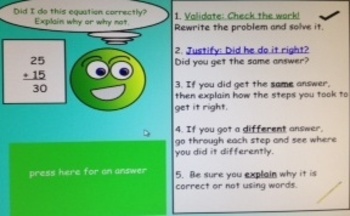 After the explanation, the next 5 slides take students through adding 2 and 3 digit numbers with carrying into both the tens and hundreds to teach students how to validate (check the answer by doing it themselves and comparing with the sample answer) and justify (explain why the sample answer is correct or not). 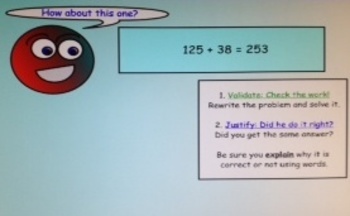 Using friendly Dots, who tried to do some math and want us to check their answers, students learn and practice the skills of validating Mr. Dot, Mrs. Dot, or Miss Dot’s answers, and then justifying why the Dots answered the equation correctly or not. The final slides take students through subtracting 2 and 3 digit numbers. 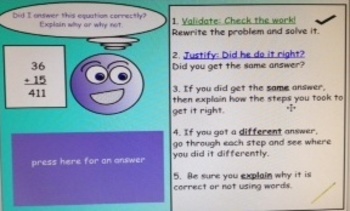 Students can make up their own problems and have a partner validate and check.